Jonas Salk is best known for the polio vaccine that he and his colleagues developed at the University of Pittsburgh. Its introduction in 1955 was followed by a rapid reduction in the crippling epidemics of poliomyelitis that had caused pervasive fear. He is also known for the creation of the Salk Institute for Biological Studies in La Jolla, California. He is less well known for his philosophical contributions, which Bill Moyers called “The Science of Hope”. Born in New York City and raised to believe that each person was responsible for making a difference in the world, Salk attended City College and graduated from New York University’s School of Medicine. He began his career as a medical researcher working on the development of the first influenza vaccine with his mentor, Thomas Francis, Jr., at the University of Michigan. Soon after becoming Director of the Virus Research Laboratory at the University of Pittsburgh School of Medicine, he became focused on polio. The National Foundation for Infantile Paralysis, later known as the March of Dimes, began funding Salk’s polio work in 1948. Less than seven years later, on April 12, 1955, it was announced that the Pitt team’s inactivated polio vaccine was safe and effective. In the four years before the vaccine became available in 1955, an average of 40,000 polio cases per year were reported in the United States. By 1961 the number of reported cases had dropped by 97%. 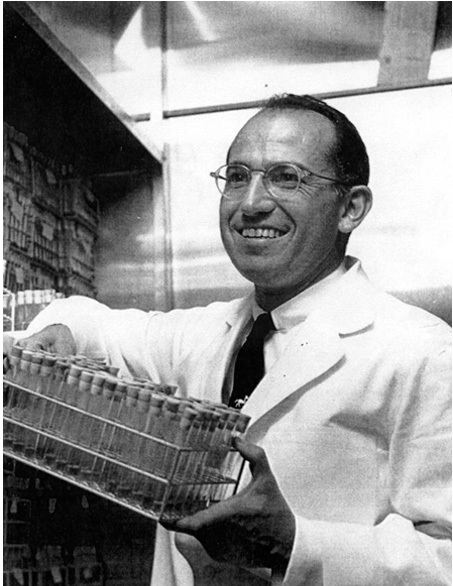 With continued support from the March of Dimes, Salk founded the Salk Institute for Biological Studies in 1960. Designed by the architect Louis Kahn, with whom Salk worked closely, and recognized as an architectural masterpiece, the Salk Institute has become one of the world’s premier biological research institutes. Its 61 faculty members and scientific staff of over 850 conduct research in molecular biology, genetics, the neurosciences and plant biology. More than a dozen Nobel laureates have been resident or non-resident faculty members of the Institute or have done their training there. During his subsequent years of research, Salk worked on immunological approaches to treating both cancer and multiple sclerosis (an autoimmune disease). In collaboration with other researchers, he worked on improving manufacturing methods to produce a more potent version of the killed poliovirus vaccine. At the time of his death in 1995 he was working on another inactivated virus vaccine, this time to slow the development of AIDS in individuals infected with HIV, with the intention of testing it for its ability to prevent infection and disease in uninfected individuals. In addition to his scientific work, Salk wrote four philosophical books outlining the perspective he had gained regarding, as he put it, both nature and the human side of nature. He advised national and international leaders on health policy, and mentored many young scientists and thinkers, fostering interactions among individuals working in diverse fields of study in the natural sciences, the social sciences and the humanities. He maintained a vision that interactive relationships of this kind could lead to a fuller understanding of humankind’s capacity to emphasize and draw out its best characteristics to deal most constructively with the challenges and opportunities we are now confronting in this unique period of our evolutionary history. Images of Jonas Salk used with permission of the family of Jonas Salk. Profile photo of Jonas Salk by James A. Cox.